General Electric will reimburse Massachusetts $87 million for an incentive package after announcing it would scale back its operations and sell its Boston headquarters. General Electric announced Thursday it plans to reimburse the state of Massachusetts for the $87 million incentive package given to them when the company moved its headquarters from Connecticut to Boston. The announcement comes as the company confirmed to NBC10 Boston it plans to scale back operations and sell its Fort Point channel headquarters. That parcel includes two Necco brick buildings owned by the state and the adjacent parcel owned by GE which is vacant. Jeff Caywood, GE headquarters communications director, said following the sale of the property, the company will reimburse MassDevelopment for out-of-pocket expenses including the purchase of the two brick buildings, land, construction, and other related financing costs. "We are looking forward to moving into our permanent headquarters space in the refurbished Necco brick buildings later this year. While changes in the Company's portfolio and operating model will lead to a smaller corporate headquarters, we are fully committed to Boston and proud to call it home," said Ann R. Klee, vice president, GE Boston Development & Operations. 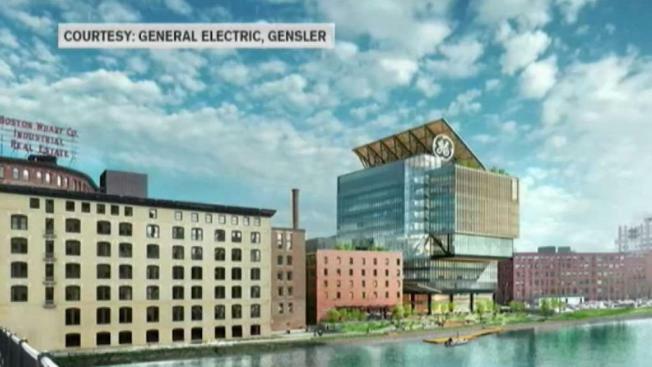 General Electric has broken ground on its new Boston headquarters, another step in the company's digital transformation. The company still plans to move its headquarters into the two buildings at Necco Court. The 800 jobs that had been promised, however, will not be close to being fulfilled and will house GE's senior executive team and 250 employees. General Electric, no longer a component of the Dow Jones industrial average, has been shrinking itself since the recession. In October, the company slashed its quarterly dividend and announced it was restructuring its power business after a larger-than-expected third quarter loss. Earlier that month, the company ousted its then-CEO John Flannery after only about a year on the job and replaced him with Larry Culp, who told investors it had become clear that GE needed to simplify its business structure. The company's fourth-quarter revenue of $33.28 billion did exceed Wall Street forecasts. Massachusetts officials have sought to put the best possible face on GE's sagging fortunes since trumpeting the January 2015 decision to relocate the company's world headquarters from Fairfield, Connecticut, to Boston. The incentives package included up to $120 million offered by the state through grants and other programs and as much as $25 million in property tax relief from the city. The administration remains "proud that General Electric chose to relocate the company's world headquarters to Massachusetts and looks forward to GE's ongoing contribution to the growing innovation economy," said Elizabeth Guyton, a spokeswoman for Republican Gov. Charlie Baker. "General Electric chose Boston because it is a thriving city with a talented and diverse workforce, culture of innovation and opportunity for all," Boston Mayor Marty Walsh added. "I'm proud that General Electric brought its headquarters to Boston and I look forward to our continued partnership." The company has not used the property tax abatement offered by Boston and will be canceling the agreement with the city because it was contingent upon the construction of the office tower and the hiring of up to 800 jobs.